As many of you are aware I moved to Kelowna to assist my aging mother. Life can be pretty complicated at times but especially when you are 87 years old. Lately her health has been declining and she is needing more support service to maximize her independence while staying in her budget. She is, like so many seniors, on a fixed income which is not keeping pace with cost of living. When your assisted living rent is raised by 4.2% but your government pension only increases .09% it doesn’t take long to out pace your monthly budget. And now she is facing a $4/month increase in health care premiums. These things start to add up quickly and it becomes death by a 1000 paper cuts. One aspect of her income is the widows extended health benefits that came with my fathers government pension plan. As his widow she is entitled (and contrary to what the Harper government would have us believe there is nothing negative about entitlements) to certain services and coverage. One aspect of that coverage involves receiving some reimbursements (80%) for her prescriptions. On a fixed income that can be important and often makes a difference between food or prescriptions. With the new proposed cuts to the federal government’s retirement plan recently announced by this body we call a government in Ottawa I wanted to find out what that would mean to her coverage. So I went looking at various government websites for a bit of detail on what these cuts will mean. If it is as it sounds (a cut back to 50% coverage) that would put her medical costs passed her monthly income level. To an 87 year old that is very threatening. Well true to form with this government the details on these cuts were absence. So I decided to contact the MP for this area, Ron Cannan, to get him to do what MP’s are suppose to do, represent their constituents and provide information. This is not the first time I have reached out to this man for information however I prefaced this message by stating I didn’t want a prepared statement that was a cut and paste like I received the last time. I also did a quick review of the Parliamentary Hansard to see just how many times Mr. Cannan had spoken up on behalf of his constituents in the House of Commons. A quick search revealed nada. Not once could I find any comment made by him on behalf of seniors or veterans. Both of these issues are important to an area like Kelowna since this city is retirement central and the Veterans Centre was just recently shut down despite a loud outcry from, not only the Veterans, but the public in general. To Mr. Cannan’s credit he did call me. However with that said he was terse, lacked any real information, was devoid of details and quick to repeat the daily speaking notes. I know everybody is not as politically informed as myself. I told him that I want some details, not PMO script, so we could do some planning for my mother. The outstanding work his government is doing even hit government inspections services and I asked him quite openly how that was working for them. I found the man to be basically uninformed, rude and true to the Conservative nature in Ottawa he was turning me into the bad guy. I was questioning his answers and I have come to realize you do not question this government. It was one of the most frustrating, belittling conversations I have ever had with a politician and I have had my fair share of interaction with politicians. 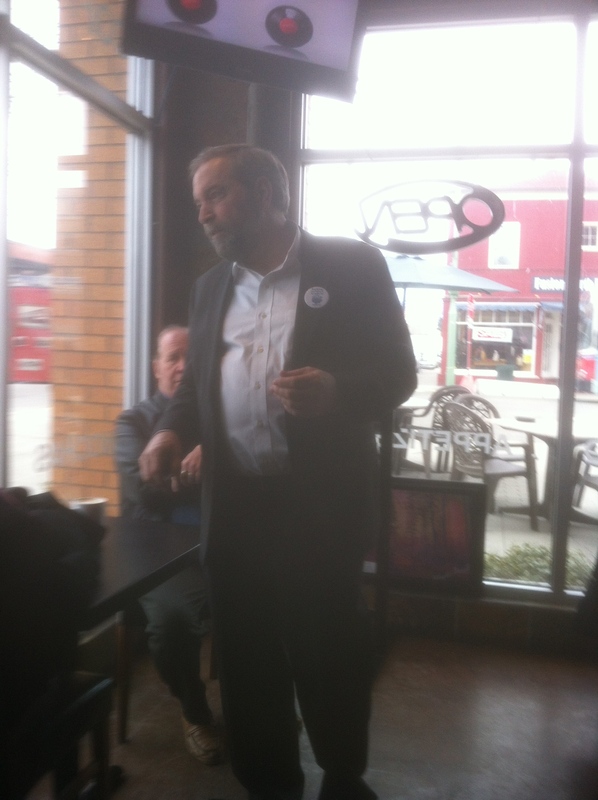 As it happened Tom Mulcair was in Kelowna the next day so I decided I would try and meet with him which I did. He was informative and pleasant to deal with. I made it clear that it is not important that everything that comes out of Ottawa has to be something I agree with but I do want to be heard while not being talked down to. I found Mr. Mulcair to be very respectful and also expressed a desire to get rid of the vitriolic rhetoric coming out of Ottawa these days. Since I had recently read it and question Mr. Cannan on it I raised the issue of the new Fair Elections Act. I was interested in hearing how Mr. Mulcair’s response aligned with Mr. Cannan. Anybody that has paid any attention to that Act should realize just how undemocratic it is. Any piece of legislation that muzzles oversight bodies, like Elections Canada, is a major backward step to democratic reform. I’ll tell you right now I don’t know a lot of visually impaired persons or a lot of aged seniors that have picture ID. And again this Act takes away from the oversight body that has worked for Canada for well over 60 years and longer. Mr. Mulcair answered a lot questions and treated people in attendance very respectfully. Now for the record I am currently not a Party member of the NDP. Following the way Mr. Cannan dealt with the concerns I raised on behalf of many marginalized individuals that may change soon. I would rather work with a group of politicians who are prepared to work for EVERYONE while coming from a position of democratic process rather than a group of individuals who work purely from ideology and their funders. This entry was posted in Politics and tagged Canadian veterans, democratic erosion, democratic process, NDP, seniors benefits, Stephen Harper, Terry Wiens, Tom Mulcair. Bookmark the permalink. I am certain you are going to get more than your fifteen minutes of fame in the months and years to come. Also, it is reassuring to see that you are looking after your mother’s best interests when it appears that once again, the Harperites continue to chip away at citizen rights and entitlements while handing over bits and pieces of the nation to corporate interests.